When it comes to measuring the overall efficiency of a fusion reactor—how much power output can it produce for a given heating input power—it's important to know that a large part of the electrical energy inputted into the machine is used to power the gyrotrons. The gyrotrons will heat the plasma through a technique called electron cyclotron resonator heating (ECRH). In ITER, the radio frequency sources for the ECRH system will be composed of 24 gyrotrons procured by Russia (8), Japan (8), Europe (6) and India (2) for a total combined heating power of 24 MW. Directly associated to the performance of the gyrotrons are their high voltage power supply systems. These power supplies convert the grid voltage to the appropriate high voltage levels required for the gyrotrons (55kV-110A). Not only must the power be provided with the highest efficiency but power rise and fall times must also be extremely short in order to properly trigger or shut down the gyrotrons, which will ensure that such very expensive devices are well protected against any damage such as arcs building up inside the gyrotron itself. 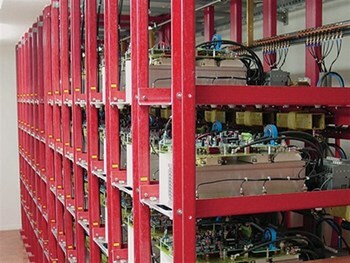 The contract for the design, manufacture, installation and commissioning of the power supply systems of the European and Russian gyrotrons was recently awarded by the European Domestic Agency Fusion for Energy to Ampegon, a Swiss SME based in Turgi, near Zurich. "The power supplies are a critical element of the energy transformation chain for the ITER machine. We are very proud to contribute with this significant subsystem and be part of the world's largest fusion project," said Ampegon CEO Josef Troxler at the signature ceremony. Ampegon's Michael Bader, head of RF and Power Electronics, and his team fine tune high voltage power supply equipment. Ampegon is the first Swiss SME to be awarded a contract for ITER. "Ampegon's contribution to ITER's power supplies will make an important contribution to the overall energy efficiency rate of the machine," added Michel Hübner, Switzerland's Industry Liaison Officer for ITER. "I am pleased that Fusion for Energy has entrusted a Swiss company with its expertise to manufacture this highly challenging equipment. This is the first contract awarded to a Swiss SME and I hope that more will follow." This latest contract is the sign of the strong relationship between the ITER Project and industry, according to Fusion for Energy Director Henrik Bindslev. "ITER offers a vast range of business opportunities to small, medium and larger companies. This latest signature proves yet again that SMEs have a role to play to the most ambitious international collaboration in the field of energy." Ampegon is a highly specialized company in the field of high power radio frequency (RF) engineering. As a leading manufacturer of high power AM/DRM broadcasting transmitters, high power RF amplifiers, regulated high voltage modulators and power supplies for more than 75 years, Ampegon has significant experience and know-how in the field of RF amplification, power electronics and fast signal processing. Domestic Agency Fusion for Energy. Read the full news on the contract signature at Fusion for Energy.